As a mother, I worry about the safety of my family especially when they are outside the confines of our home. My youngest son is still a student, so he spends most of his waking moments in school and away from me. When he enrolled in his high school, the first thing I asked if the school had fire alarms. I know it sounds crazy, but you can’t blame me. A fire can take place at any place even if there are systems in place such as smoke detectors and water sprinklers. Therefore, it’s always a good idea to review the emergency preparation plans in schools (or anywhere else for that matter). Fire disaster preparation plan involves two things – information and delegation. For instance, the first thing a student should do is look for manuals or any signage that point where the nearest fire exits in the school buildings are. These signs are often posted at the back of classroom doors. Faculty and staff should make it a point to discuss everything related to fire emergency preparation plans including exercise of improvements where needed. Once a well thought of plan has been reached, this must be explained to the students. It’s best to make the students aware of the gravity of these plans. These aren’t things that can be taken lightly. The school must see to it that these are firmly stressed because this could mean a matter of life or death to everyone when this happens. The school should conduct regular fire drills. Groups of people must be delegated when there’s a need to evacuate the school building. A member of the staff or faculty should collaborate with a student and be put in charge of fire extinguishers, making sure that these are placed in appropriate hallways and in the classrooms. Finally, the head of the school should assign an assembly point where everyone evacuated from the school building should meet so everyone can be accounted for. Everyone should wait until inspection is done and someone with higher authority issues the order that it is safe to go back inside. Everyone should be well informed of the fire emergency preparation plan since this is the only way to get out of a dangerous situation. The importance of this cannot be discounted. Good thing we have regular fire and earthquake drills in the university I work in. You're not strange in asking about alarms and exits. When I ride an airplane or go to a theater, I always keep a mental note of the nearest exit, so that even if the lights go out, I still know where to go. I completely agree with you, Joy, when you said that fire drills and disaster preparation drills in school should never be taken lightly. The sad truth is that, unfortunately, kids in school do. I'm guilty of that. Perhaps it's because of the way how they handle these drills. It could help if schools could make the scenarios more realistic, like not announcing when they will be doing the drill to the students. i remember doing those fire drills when I was still studying and even when I was already working. Inspectors from Makati City Hall would go to our building and inspect if fire extinguishers are in place and made sure that fire exits are not blocked by unnecessary things like boxes. Fire drills were also done which i didn't find effective. We had a female officemate who was kind of stout and a little old and she could not go down properly on the narrow staircases. we would joke on her that if it was a real fire all the people behind her would already be toasted. 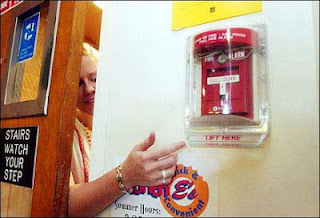 Fire drills in schools, offices or any organization must be properly established. I never run out of patience when there is an activity like this because it is for everybody's safety. I did the same thing when RJ enrolled in the big school...I asked a lot about the school's safety measures I am glad that RJ's school conducts fire and earthquake drills every year. Conducting a Fire drills and Emergency preparation in school is necessary. Since,accident cannot be predicted.